For the fans of rhis game"
Angry Birds is a popular game that combines many skills of the player. The player can launch towards the objects that will need to get hit through keyboard. It is the arcade game that created an innovative twist to gaming on mobile and PC. Certain video games are thought to teach children high level thinking skills that they would benefit from later on. Other are just for fun or both. The theme contains a set of ten images with high-definition resolution (1920 x 1080 pixels) . This size works perfectly on all screen resolutions and sizes (including 16:9). Let the birds to follow you and to be present on your desktop. This will bring more fun and will remind you to play the game, no matter if is Space, Rio, Seasons or the classic package. 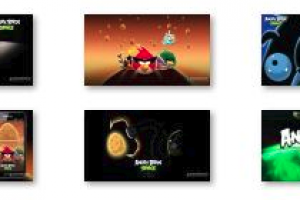 Angry Birds Space Windows 7 Theme is licensed as freeware for PC or laptop with Windows 32 bit and 64 bit operating system. It is in themes category and is available to all software users as a free download.